Dysphagia is a common adverse effect resulting from radiation therapy for cancer. 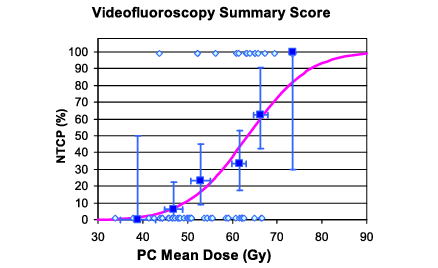 Since clinicians can vary the radiation dose on a fine scale, it is natural to ask how the risk for adverse events quantitatively changes as the radiation dose increases. Logistic regression is a widely used tool for relating exposures to risks. When working with a continuous exposure such as radiation dose, it is possible to combine model-based analysis with logistic regression, and descriptive summary statistics, to assess whether the exposure affects the risk as specified by the model. CSCAR Research Scientist Myra Kim recently collaborated with researchers from the UM Medical School to examine how the risk for complications is related to the radiation dose in patients being treated for oropharyngeal cancer.